This dynamic duo of iconic and elegant timepieces, the first created specifically for women by Parmigiani Fleurier, the Kalpa Piccola and Kalpa Donna, sport the signature tonneau lines and radiate elegant feminine charm and with their striking make a stunning. These exceptional watches will make an ideal Valentine's Day gift for the special woman in your life. When creating the design for the Kalpa Piccola and Kalpa Donna, which are identical apart from size, Michel Parmigiani used the perfect proportions of the golden number as his foundation. He then enhanced the harmony of these proportions with gentle, rounded details like the delicate curve of the case, which extends to the rounded horns. These are specially angled so that the resulting profile sits perfectly on the female wrist, ergonomically designed for total comfort. The dial on the Kalpa Piccola and Kalpa Donna features guilloch� work evoking the sun's rays, and providing a subtle reflection of the hour segmentation. The pattern becomes a form of index. Each dial is coated in a coloured lacquer, with intense pigments that sparkle and gleam, reinforced by the visual effect of depth created by the decoration. The numerals 12 and 6, with their striking setting of Top Wesselton diamonds, were also designed by Michel Parmigiani. He drew his inspiration from Art Nouveau when sculpting their contours, a style based on perfect curves where the female figure is omnipresent. With the hour and minute indication in the centre, the quartz movement driving the Kalpa Piccola and Donna is a perfect example of the consistently high requirements of the watchmakers at Parmigiani Fleurier. The Kalpa Donna is only available with a steel case. This can be stone-set, or plain, and diamonds can even be extended onto the bracelet for perfect continuity. The dials are available in ivory, sky blue, and amaranth, hues which perfectly complement the linen colour of the alligator strap. The Kalpa Piccola is available in a version with a rose gold case and bracelet, and an ivory coloured mother-of-pearl dial. 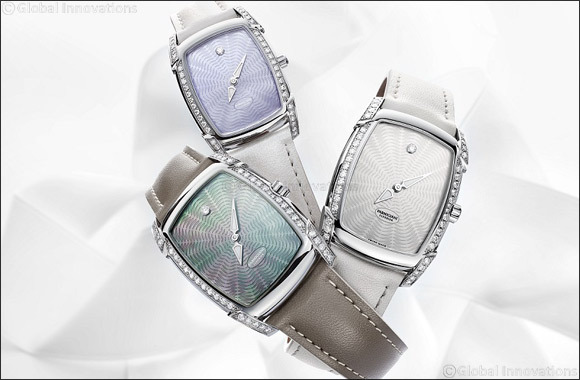 The Kalpa Piccola and Kalpa Donna family is the cornerstone of the Parmigiani Fleurier women's collection. Their carefully crafted design and the beauty of their details place these watches at the crossroads between femininity and the art of watchmaking.